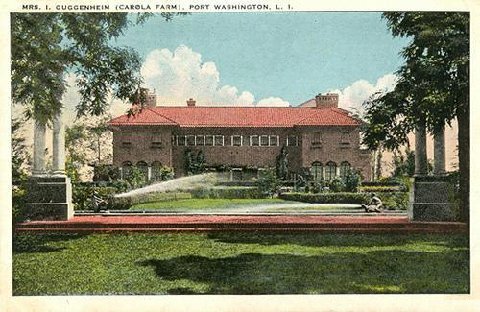 'Villa Carola', the Isaac Guggenheim estate designed by Howard van Buren Magonigle c. 1916 in Sands Point. Click HERE for more on 'Villa Carola'. Click HERE to see the estate on google earth and HERE on bing. Wow HPHS is on a mission to awaken a sleeping giant...........Villa Carola, not designed by CPH, is a beautiful courtyard house. I understand the interiors are still relatively intact also after serving so many years as an IBM corporate and now village golf club. Had quite extensive formal gardens at one time. Always thought the entrance gates with the clock a nice touch. I think it is an original feature. • The house stands intact, without some huge addition nailed onto one side. • The pro shop is away from & almost invisible from the house as is the swimming pool & its modern building. • The alee is still there, which I think is remarkable, & the outline of the formal garden has been left alone. We’ve all seen much worse adaptations of large, old houses … some other organizations should take notes here. This is Mr. Dilettante's assistant again. He asks me to inform Mr. Pudding Sauce that he is in seclusion, studying the works of Palladio and Scamozzi, to be followed by Vanbrugh and Wren, and then le Notre, in order that he might bask in true genius far from the doleful influence of certain less talented designers. Therefore, I will be commenting in his place. But if he were here, he'd comment favorably about this house saying something like: What is fascinating to me is that this house and Vizcaya were started in the same year, and are in some ways of such similar composition---and even use some of the same craftsmen. Fascinating that Guggenheim's early intent was toward French Beaux Arts, as seen in the outbuildings that pre-date the main house, and obviously shifted gears. The wordpress link by DED which I have seen before really shows the beautiful details that are not seen in the photo here. The incredible subtle coloration of the exterior bricks and the wonderful terracotta work, not to mention that pair of iron gates at the front door are all outstanding. Hopefully OLI will be adding some interior photos and landscaping views for this home one day. Uh huh. My breath is bated. DED, I’m not sure I would call you sweetness & light … or that I would even want to use such terms for you. What I do know is that you’re passionate about … let’s see … something I read … “Architecture, Art, Books, Design, Landscape, & Other Whims.” I applaud your passion for these things & appreciate your opinion, even when I disagree. Please fire your assistant & come back the way you are because just like Turner Pack Rats you’re a reminder that one size does not in fact, fit all. This is indeed a wonderful re-use of a unique house. DFP - aren't you feisty today! Description Georgian style mansion c. 1934 built for Paul Denckla Mills and his wife the former Ellen Drexel Paul (daughter of financier James W. Paul and grand-daughter on her mother's side of Anthony J. Drexel). Mills was a stockbroker and the son of General Samuel Miles the one time commandant of US Military Academy. This looks like a Mott Schmidt to me. Chip, 'Even Tide' suggested Bottomley or Schmidt to me, in that order, but discovery of this house ( http://www.flickr.com/photos/historicric/sets/72157621876719503/ ) now makes it shout Bottomley, don't you think? LOL DED -- when you say "to trip" ... is that a drug reference? That's a good find! I only thought of Bottomley as a Virginia architect but of course he must have worked elsewhere too. Love that Tatton Hall!